Mabel’s Labels: 50% off Robot and Rocket Sticky Labels!! 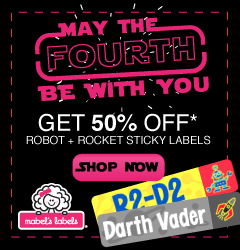 The force is strong with this offer because for one day only, on 5/4, Mabel’s Labels is offering 50% off Robot and Rocket Sticky Labels in honor of May the 4th be with you! May 4th celebrates the Star Wars Trilogy that has entertained thousands of fans from all over the world. Don’t miss your chance to shop this great offer! Head over here and check out this great offer!